June is always a crazy busy month for me as it happens to be the month where 90% of people I'm closest to were born including my husband and my Mum. It's also my favourite time of year to take a holiday before the craziness of the school summer holidays begin. The business of this month has meant that i've been feeling generally pretty shattered but also pretty happy too! I've felt well in myself and relaxed despite things feeling a little out of control. Our new puppy Suki has been super tiring with her early morning starts and having to be on top of her toilet training at all times. But it's definitely been lots of fun too! The official start of Summer has bought with it the dreaded arrival of hayfever which always makes life feel that little bit more like a struggle. I kicked off June in style with a visit to one of my favourite Spa's with my Mum for her birthday, Lifehouse Spa in Essex. It was so nice to just relax all day, jump in and out of the hot tub and go for leisurely swims. We also had a neck, back and shoulder massage included in our deal which was amazing and definitely helped at easing some of the tension I tend to store up in my shoulders. Suki our gorgeous puppy has been a main focus of our life lately. She's kind of taken over everything! We've been practising a lot of training with her and getting her ready to start going out for her big girl walkies. There's been quite a few visits to the vets for all her puppy treatments and vaccinations. 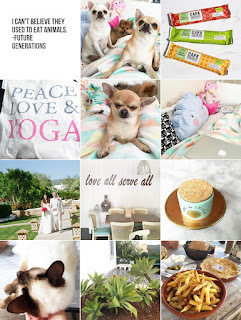 We don't tend to ever leave our dogs for very long anyway, and they have the luxury of having us around on a daily basis, but having a new puppy has meant we haven't been able to go out as much and spontaneous activities have gone out the window. Aside from our holiday we've definitely spent more time at home but who's complaining when this girl is our excuse! I've been continuing to attend my Monday morning restorative yoga classes which i've really been enjoying. I feel so happy to have found a class which really suits my needs and i've really noticed the benefits of regularly practicing yoga, meditation and mindfulness. This class is definitely more about the mind than the body but the light stretches we do have definitely helped ease my back pain problem. 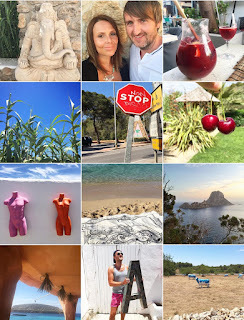 The best thing about this month was that we got to go back to Ibiza! It's by far my favourite holiday destination and somewhere we love going back to. We were away for 10 days in total which felt like the ideal amount of time to really unwind and relax. 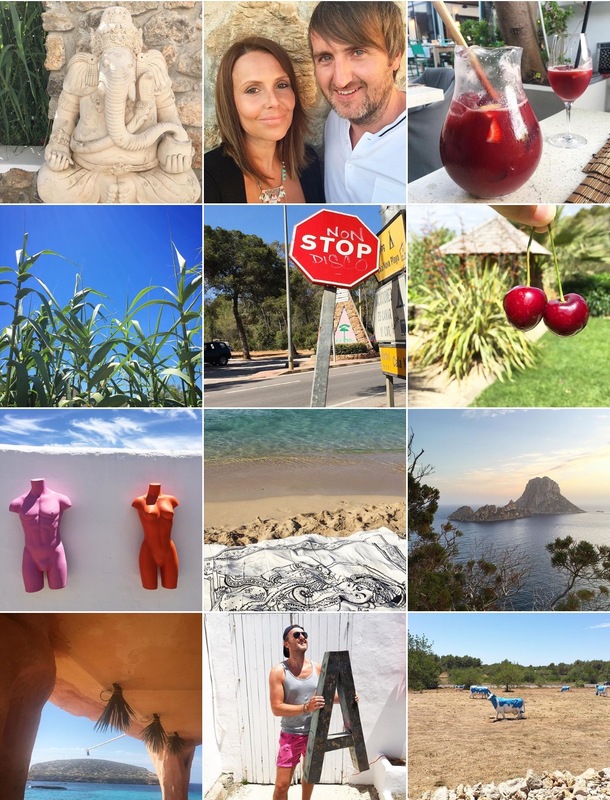 The weather was glorious the whole time we were there and I do feel that June is a perfect time of year to visit Ibiza as the island isn't as busy as it can get at peak Summer times and the weather is spot on! 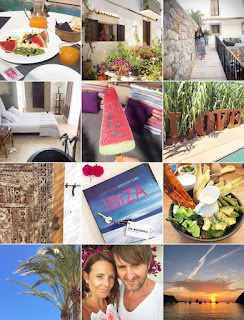 I was really looking forward to exploring vegetarian and vegan restaurants on our visit and as you can see from my recent Vegan Ibiza blog post we were pretty spoilt for choice! Last week my husband Andy celebrated his birthday and we went out for a celebratory meal to The Gate in Islington, London. Unfortunately the restaurant wasn't quite what we hoped it would be and it just so happened to be the evening where the bad thunder storm hit London, but we still managed to have a lovely evening out together! We really were amazed by some of the vegan and vegetarian food on offer in Ibiza and I for one really enjoyed sampling a diverse and colourful array of smoothies throughout our time there. A highlight of the food we tried in Ibiza were these impressive avocado fries! I couldn't quite believe such a thing existed and I have to say they were a bit on the sickly side but even so - avocado fries!! Since being home we've tried to get back into some kind of healthy eating regime again which is really quite difficult after spending 10 days over indulging. We're getting there slowly but surely and hopefully it won't take too long to shift some of the extra lbs we put on! This month I had my first experience of ordering off the menu at a meat orientated pub restaurant, The Compasses, and as you can see from the above photo it didn't turn out to be a bad meal. We enjoyed a family lunch at Prezzo's last week and after carrying out some research online I was pleased to find out that their pizza bases are vegan friendly. It would be great to see Prezzo follow in the footsteps of Zizzi's and create their own vegan friendly menu but until that happens just ask for cheese to be removed and add on your favourite veg friendly toppings. Despite it being renowned for it's chicken, I really enjoy the veggie and vegan options at Nando's, especially those peri salted fries which are to die for! I usually order the veggie pitta with no mayo and an extra side of avocado which, along with the chips, is a really decent meal out. I know many people who wouldn't choose to eat there because of the other food available but I personally think it's important to show a demand for the veg options. It's also nice to know that you can get a meal at a regular high street chain restaurant, especially when dining out with non veggie friends. If you're subscribed to my YouTube channel you would have hopefully already seen my M&S vegan chocolate taste test video. I'm so happy M&S have taken steps to start offering more vegan friendly options in their stores and this chocolate is so good i've already been back to buy some more. One of my first June purchases was this Pinita Colada Body Butter from The Body Shop which, if you haven't had the pleasure of smelling yet, smells amazing!! It has a lovely pineapple and coconut scent which is one of my all time favourite combinations and it's perfect for Summer time. After seeing Eco Tools on a 3 for 2 offer on the Superdrug website I couldn't resist picking up a few bits and pieces. It's a brand i've seen a lot of other bloggers rave about so I was interested to see how these budget friendly brushes compared to my more expensive ones. So far I have only had a chance to try out the Kabuki brush which has really impressed me and I love the handy little retractable case it comes in which really helps to keep your make up bag cleaner. If you didn't already know, Eco Tools brushes are completely cruelty free and they use vegan friendly synthetic bristles. Their brush handles are also made from sustainable bamboo and recycled aluminium so they're a great choice for the ethical shopper. Other items I have picked up from Superdrug this month include their own brand Solait Tinted Bronzing Lotion which I am yet to use but I am hoping it will help me to keep my holiday glow lasting a bit longer! I also couldn't resist the lure of this Makeup Revolution Iconic 2 eyeshadow palette which includes a really beautiful array of brown, taupe and gold shimmer and matte colours. And it was time to re-stock on my favourite concealer of the moment, Lasting Perfection by Collection. I was recently very impressed to read Stella McCartney's responsible sourcing policies and learn that her fragrances are 100% cruelty free and vegan friendly. This really was music to my ears as her original 'Stella' perfume is one of my all time favourites! As I was at the airport this month I took the opportunity to treat myself to one of her big bottles. 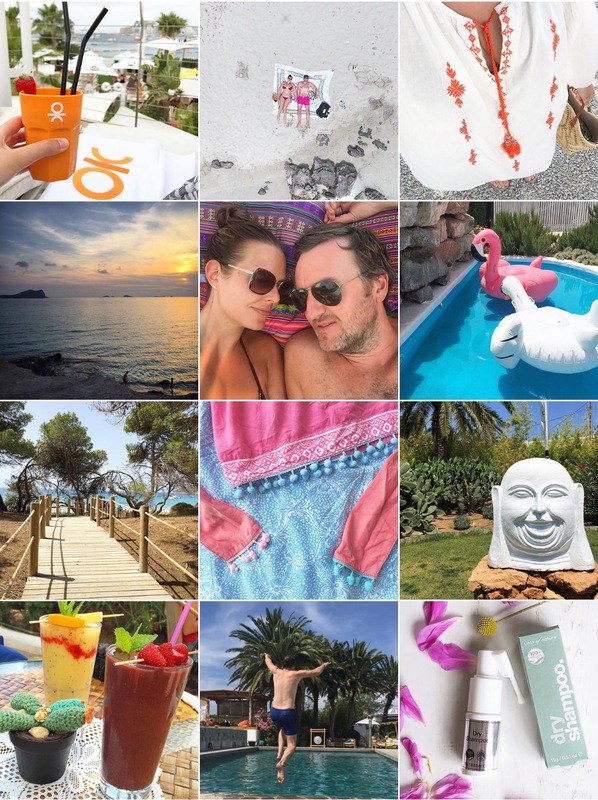 If you happen to visit Ibiza I'd definitely recommend picking up a pot of their Sal De Ibiza which is natural sea salt harvested from the island. I love salt and consider myself somewhat of a salt connoisseur so I can tell you that this is the best salt I have ever tasted! It really does add something special to every meal you add it to and I for one can't get enough of it. If you're desperate to try some i'm pretty sure you can order it online from various websites so go check it out! This month I treated myself to my first ever copy of Blogosphere magazine which is a publication made by bloggers for bloggers. I was really intrigued to find out more about this magazine and when it arrived I was not only impressed to find a fellow vegan on the front cover but also to find it jam packed full of interesting and useful articles for bloggers. I can see this becoming a new regular purchase for me! As we are over half way into 2016 now I felt the time had come to treat myself to a new diary and I really love the selection of mid year diaries available in Paperchase at the moment. I picked up this cute 'Another Year Another Story' diary as I love that it's the perfect size to carry around with me in my handbag. If you're a fellow stationery geek like myself you will know that no feeling beats that of writing plans into a brand new diary! June has been the month where my favourite flower, the Peony, has been in season and I have therefore been picking up a fresh bunch at every opportunity! They're such amazingly beautiful flowers which I just love to watch get bigger and bigger as they open up. They cheer my home up so much and they also make the perfect accessory for blog photos. I'm quite looking forward to life being less busy in July! We have no breaks away planned and the plans we do have are quite nicely spread out throughout the month which will hopefully mean that we can get back into our normal day to day routine again. I've booked to go on a 'yoga for anxiety' workshop this weekend which i'm really looking forward to. I've also booked a place on an 'iPhoneograpy' workshop in Cambridge later this month which will hopefully teach me how to take the best photos I can on my phone. Next weekend we shall be going along to the Just V Show at London Olympia which, if last year is anything to go by, will be a great opportunity to pick up lots of yummy vegan food! I definitely recommend checking it out if you've never been before.